DW Clark’s greenhouse project started by accident. Clark got the materials for his project from a friend who was replacing the windows in her home. Clark has lived in the northwest area for 15 years now with his wife and works at KOMO TV. As an avid recycler he never contemplated using anything else but reclaimed items for the greenhouse. He has other projects he’s built recently including a pergola and a planter out of salvaged building supplies. “I have always enjoyed finding new uses for discarded material,” he said. 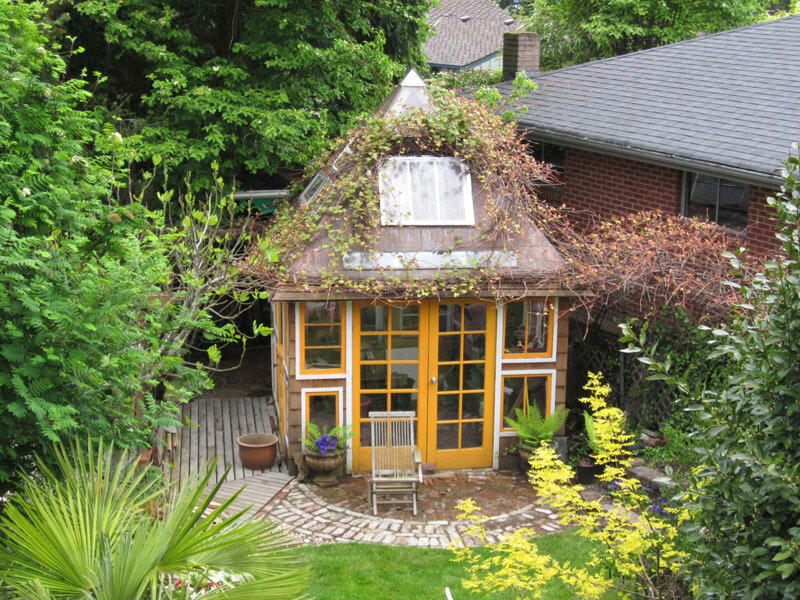 The potting shed took Clark two years to complete by himself. Clark said that he faked his construction skills for most of the project. One interesting thing about Clark’s potting shed is that the top is built in the same proportions as the Cheops Pyramids in Egypt and is oriented to north. Visit The RE Store’s do-it-yourself guides to download a free guide for designing your own shed with used materials: “Extra Space or Special Place”.